??? Wedge type hollow blade dryer can be used to heat or cool paste, granular, powder or starchy materials indirectly. 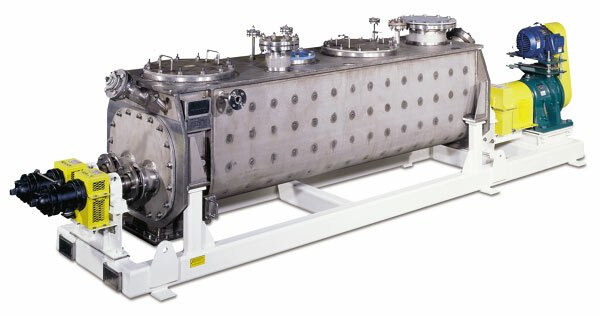 It can carry out the processes of drying, cooling, heating, sterilization, reaction and low temperature calcination. The wedge type heat transfer stirring blades can help make sure of high heat transfer efficiency. Besides, the heat transfer surface has a self-cleaning function. Wedge-shaped hollow blades are lined densely on the hollow shaft. Heating resource will flow through the blades through the hollow shaft. The heat transfer surface may be very large in unit effective volume. Heat resource may be steam or liquids such as hot water or heat conducting oil with different temperatures from -40℃ to 320℃.Because of the indirect heat transfer, the air won’t carry away any heat. Thus all the heat will be used for heating of materials.? The only loss of heat is due to the heat dissipation from the insulating layer to the environment. The wedge-shaped blades have a self-cleaning function. The relative movement between the granules and the wedge-shaped surface will cause scrubbing, which can get rid of the attachments on the wedge-shaped surface. Thus there is always a clean heat transfer surface while the running of the machine. The blade dryer has a W-shaped housing, inside which are two to four hollow stirring shafts. The seal cover and the upper cover will prevent the powders from leaking out and at the same time collect the solvent or steam .There is a baffle at the outlet, which will make sure of a high level of material layer so that the heat transfer surface will be covered with materials and play a good role. Heat transfer medium will flow through the rotating joint, then through the shell jacket and the hollow stirring shaft. In order to make sure of a good heat transfer efficiency, the hollow stirring shafts will have? different inner structures according to different types of heat transfer medium. 1.1. Because of the indirect heat transfer, the air won’t carry away any heat. Besides, the outside shell of the dryer has a insulating layer, so it needs only 1.2kg steam to evaporate 1kg of water in slurry materials. 1.2. Low price：Because of the large heat transfer surface area in unit effective volume, a good drying efficiency can be achieved in a short time period and a small building area and space, using a relatively small machine. 1.3. A large scope of applicable materials: Using different heat transfer mediums, blade dryer can be used to dry either heat- sensitive materials or materials that require high temperature. 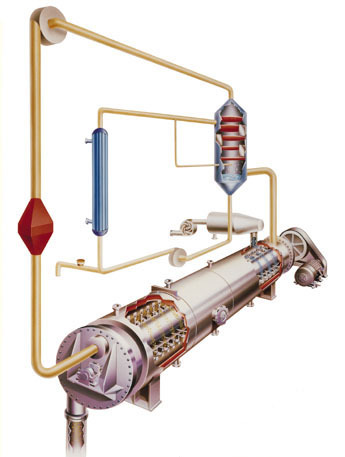 Any of the following mediums can be used for heat transfer: steam, heat conducting oil, hot water or even cooling water. So this? machine can be used in many fields either continuously or in batch. 1.4. Environmentally friendly: No air is used or carried, and little powder material is entrained. Besides, there is a small amount of solvent evaporation, which is easy to deal with. ? ?As for materials which may cause pollution or the situation in which the solvent needs to be returned, a closed cycle can be applied. 1.5. Low operation cost: When the machine is operated normally, only one hour per person per day is needed. The low speed stirring way as well as the reasonable structure can make sure that there is little wear and tear and low maintenance cost. 1.6. Stable operation: As a result of the special compression - expansion stirring way of wedge-shaped blades, particle materials will be in full contact with the heat transfer surface. In the axial range, there is a small gradient in material temperature, humidity and degree of mixing, which can thus make sure of a stable technology. Blade dryer has been successfully and widely used in the fields of food industry, chemical industry, petrochemistry, dyestuff industry and sludge industry. The characteristics of heat transfer, cooling and stirring help the machine achieve the following operations: Calcination (at a low temperature), cooling, drying (solvent recovery), heating (melting), the reaction and sterilization. The stirring blades work as heat transfer surface at the same time, which will enlarge the heat transfer area in unit effective volume and shorten the operation time as well. Wedge-shaped blade heat transfer surface has self-cleaning function. The special compression - expansion function helps stir the materials evenly. Materials make movements of“piston flow” in the axial range. In the axial range, there is a small gradient in material temperature, humidity and degree of mixing. 2.1. If heat conducting oil is used as the heat transfer medium, the blade dryer can achieve calcination work at a low temperature. For example, calcium sulphate dihydrate（Ca2SO4・2H2O）can be changed into calcium sulfate hemihydrate（Ca2SO4・1/2H2O）by calcination. Sodium bicarbonate (NaHCO3) can be changed into sodium carbonate (Na2CO3) by calcination and so on. 2.2. If cooling medium is needed, water or cool salty water can be used. For example, the blade-type soda cooling machine used in soda industry can take the place of the old air-type soda cooling machine, which can save the energy and exhaust gas treatment equipment and then reduce the cost. Blade dryer can also be used in the cooling of titanium pigment, nickel iron alloy powder and all kinds of powder granular materials. Every single blade dryer can cool these materials from 1000℃ to 40℃ below. 2.3. Drying materials without using hot air is the main function and characteristic of blade dryer, which makes it possible to recover the solvent, save energy and keep a friendly environment. So it’s particularly suitable for flammable, oxidative and thermosensitive materials or materials that require solvent recovery. Now, blade dryer has been widely used in fine chemistry, petrochemical industry, dye industry and so on. 2.4. The evenness and small gradient in temperature, humidity and degree of mixing in the axial range enables the blade dryer to heat or melt some materials and help the reaction of some solid materials. So blade dryers have been successfully used in compound and modified starch industry. Besides, blade dryers can also been used for the sterilization treatment of food and flour. The large heating surface in unit effective volume helps heating the materials to the sterilization temperature in a short time so as to avoid the change of the material quality caused by a long-time heating. Petrochemistry：Polyolefin powder, polycarbonate resin, high/Low density polyethylene, LLDPE, polyacetal particles,nylon6,nylon66,nylon12,cellulose acetate, polyphenylene sulfide, propylene-based resin, engineering plastics,PVC,PVA,polystyrene,polypropylene,polyester,POM,styrene acrylonitrile copolymer, ethylene-propylene copolymerization. Environmental protection industry: PTA sludge, electroplating sludge water, boiler soot, pharmaceutical residues, sugar residue, MSG plant residue, coal ash. Feedstuff industry：Soy sauce residue, bone-based feed, distiller's grains, food offal, apple pomace, orange peel, soybean meal, chicken-bone feed, fish meal, feed additives, bio-slag cement. Food industry：Starch, cocoa, corn kernels, salt, modified starch, pharmaceuticals. Chemical industry：Soda ash, nitrogen, phosphorus and potassium compound fertilizer, kaolin, bentonite, white carbon black, carbon black, phosphogypsum, oxidation sodium, calcium nitrate, magnesium carbonate, sodium cyanide, aluminum hydroxide, barium sulfate, calcium sulfate, calcium carbonate, dyes, molecular sieve, saponin.